Description: Courtney Ross has lived her whole life doing everything by the book. She’s a top student, the captain of the cheer squad at her Scottsdale high school, and a nervous wreck most of the time. For summer vacation before senior year, she finally has her chance just to relax. She will be spending it with her best friend, Vanessa, in her tiny hometown of Gem City, Ohio. Courtney’s hoping for a chance to breathe, and maybe even for some of Vanessa’s carefree nature to rub off on her. What she doesn’t expect is Ethan Fisher. Courtney knows she’s in trouble the minute she sees him holding a guitar at her “Welcome Back” party. Her instincts prove to be correct as she gets to know him, and she finds her head spinning. What will this mean for the girl who always plays by the rules? In her first full-length novel, Nicole Campbell delivers a perfect beach read for the older Young Adult crowd. Readers will re-live their first relationships (the good, the bad, and the overwhelming), or imagine the spark of what the future might hold in this story full of the type of intensity only found in young love. I received a copy of this novel from the author in exchange for an honest review. Since I’ve become an adult, I’ve avoided contemporary and romance novels like a plague for many reasons. Most important among them are the terrible dialogue and lack of plot that are typically a staple. When I was younger I was obsessed with Sweet Valley High novels though. I really enjoyed being able to escape into the sunny, simple, carefree life of Sweet Valley, California and its perfect protagonists’ love lives and superfluous drama. Fast forward many, many years later, and I found myself completely captivated by Gem City, Ohio and its inhabitants. It was a nice change of pace to all the serious drama and high fantasy I’ve been indulging in lately. Courtney Ross, the book’s main protagonist, is a typical 17-year old girl who goes out to have a carefree summer with her best friend in her hometown, but instead ends up falling head-over-heels for the gorgeous Ethan Fisher, who does in fact play guitar. While their relationship progressed very quickly in my opinion (but I’ve never been in love, so wtf do I know), it was very cute and not too over-the-top. My favorite characters though are the secondary characters, Vanessa and Luke! I was worried that Vanessa would be extremely unlikable based on the initial introduction of her, but she actually turns out to be the kind of best friend we all wish we could have. And Luke is hilarious! I think he steals the scene every time he’s on the page. It’s not a plot heavy book, and the characters aren’t incredibly complex though they are likeable and interesting, but it’s a fun read. In case you were wondering, yes, there are some times the dialogue made me say, “Why are you saying this?” It wasn’t a huge distraction. Teenagers wouldn’t be teenagers if they weren’t a bit cheesy and dramatic. I would definitely recommend it if you’re looking for a story that’s short and sweet. What Comes of Eating Doughnuts With a Boy Who Plays Guitar rekindled a lot of nostalgia for my Sweet Valley days. I look forward to going back to Gem City and finding out what happens with Courtney and Ethan next and definitely getting some more Luke action! 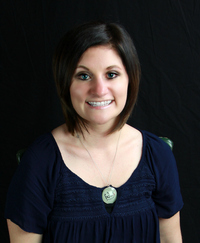 Nicole Campbell is an English teacher turned author, mother to a beautiful three year old boy, and wife to a self-proclaimed techie. Teenage life consisted of a host of adventures for her, many of which serve as inspiration for her writing. 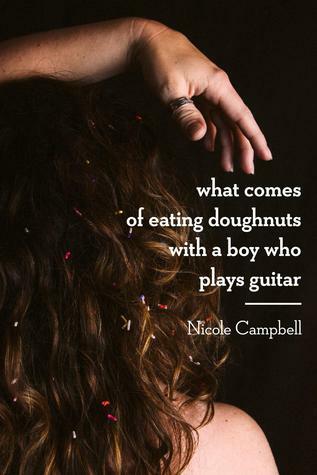 Find her online at Nicole Campbell Books, Goodreads, and Instagram.